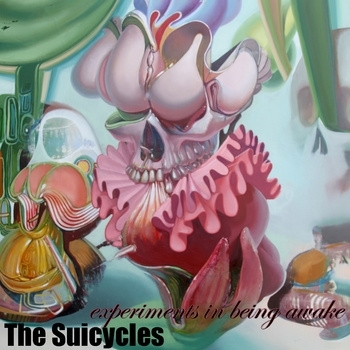 The Suicycles’ first EP, Four Chaotic Car Rides, showcased the band’s ability to write smooth electro-pop anthems, and now they have followed it with Experiments In Being Awake, which captures the controlled chaos that heavily defines the band. A notable distinction between the two releases is the addition of horns throughout the latest EP. Greg Nielsen, known for his work with Iceburn, can be heard wailing on the sax along with Anthony Phan on trumpet. This EP offers six original tracks as well as a very cool cover of Radiohead’s “National Anthem.” Camden Chamberlain lets us into his inner psychosis on the first track, “Sea Horses 4eva,” as he sings of having a “head made of steel, a heart made of stone” over a sax blasting, fragmenting the listeners attention like an axe to the head. The whole album is very bass-and-percussion-driven with complex time signatures. Check out track three, “Hawaii,” for some mean sax and guitar battling, sounding like a high speed, meth-fueled cop chase. This EP has balls—wear a condom when you listen.